Jean-Luc Khalfaoui takes office as President of the Association Agropolis International, replacing Bernard Hubert following his two terms in office. Jean-Luc Khalfaoui was unanimously elected by the Executive Board on 7 December 2017. The Board also warmly praised the progress achieved by Bernard Hubert who, after taking office in 2009, focused on enhancing the national and international status of Agropolis International, which is now a major regional platform for agroenvironmental, food and biodiversity research and education with global reach, while tapping the expertise of its member institutions that are highly competent in these fields. Supporting the development of the I-Site MUSE (Montpellier Université d’Excellence) especially in its international initiatives. Jean-Luc Khalfaoui has a PhD in Plant Genetics from the University of Paris XI-Orsay and an MBA from the International University of America of San Francisco. Drawing on his two-tiered science/management education, the new President has led a successful 30-year professional agricultural research career spanning key areas: innovative scientific knowledge production; development and implementation of research strategies; management of research institutions; development of French, European and international scientific and political partnerships, especially with countries in the Global South and Mediterranean Basin; and development of interfaces to dovetail science and business interests. His international scientific career began in 1983 in Senegal, where he was based for several years and launched the Centre d'étude régional pour l'amélioration de l'adaptation à la sécheresse (CERAAS)—now a major West African agricultural research centre that just celebrated its 20th anniversary. He subsequently returned to France in 1992 and then held various management positions at CIRAD: Technology Transfer and Development Coordinator, Deputy Director for Research Coordination, and finally Director of the Annual Crops Department. In 2005, he became Executive Secretary of the European Initiative for Agricultural Research for Development (EIARD) at the Directorate General for Research and Innovation (DG RTD) of the European Commission in Brussels, where he remained until 2009. He was later appointed Head of European and International Relations at CIRAD. In 2010, he was nominated as Research Programme Officer for Applied Life Sciences (including the scientific domains of Agropolis International) at the European Research Council (ERC) in Brussels. 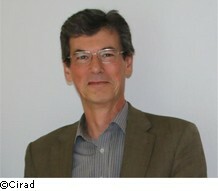 He became Deputy Director General in charge of Research and Strategy at CIRAD following his return to Montpellier in 2016.